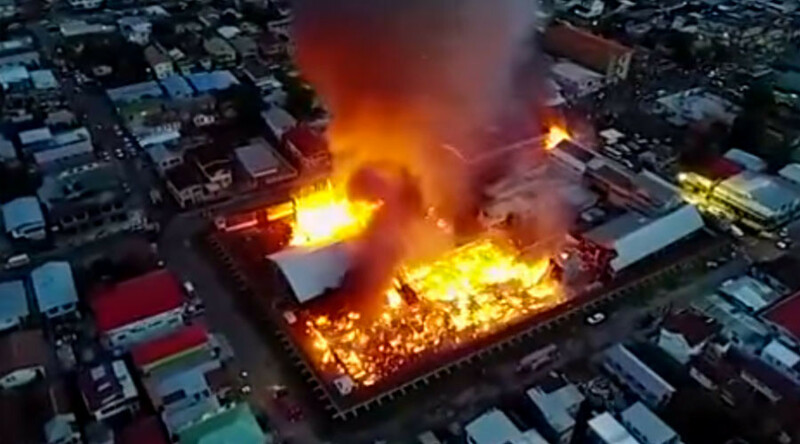 Inmates at a maximum security prison in Guyana set fire to the premises, destroying most of the building and prompting a gunfight with authorities. Four “very serious criminals” managed to escape. The chaos broke out at Camp Street Prison in the capital, Georgetown, on Sunday, after inmates managed to obtain firearms and take control of the facility, AFP reported. Prisoners then set the facility on fire in an effort to distract guards, Public Security Minister Khemraj Ramjattan told reporters. One police officer died in the ensuing gunfight between authorities and inmates, President David Granger confirmed. He said officials were still trying to determine whether anyone else died in the incident, but said he believes the blaze likely caused more fatalities. “There must be some because of the nature of the fire,” Granger said, as quoted by AP. One of the escapees was identified as Royden Williams, who was sentenced to death in February for killing eight people, Police Commissioner Seelall Persaud said. Another was identified as Uree Varswyck, whose trial for robbery and murder was pending. Persaud said that neighboring Suriname has been put on high alert in the search for the two inmates. The identities of the other escaped prisoners were not immediately known. The fire and gunfight also led to seven other people being taken to hospital for treatment, according to state broadcaster NCN. Some were identified as guards. Prison Chief Gladwin Samuels said there were no immediate reports of injuries or deaths among prisoners. Armed soldiers were deployed to the prison following news of the chaos, and security forces were able to regain control of the prison later on Sunday, even as the fire continued to rage, according to Ramjattan. Ramjattan also said that more than 1,000 inmates had been relocated to the yard of another prison compound following the violence. Around 300 of them will be transferred to other facilities, while authorities are still working to determine where to hold the others. A number of inmates also caused chaos at a prison officer's club opposite the jail after being taken there, smashing bottles of alcohol and pouring it on to clothing before igniting it. Last year, inmates at the same prison set fire to their mattresses to protest against overcrowding and long trial delays, leading to the deaths of 17 inmates. Prisons in Guyana are indeed overcrowded, housing 256 per 100,000 of the country's population, according to the Inter-American Development Bank (IADB). That figure is “well above” the world average of 146 per 100,000, according to the IADB, which launched a US$8 million project to combat prison overcrowding in December. Guyana, a small country in South America, is home to an estimated 735,000 people. It is bordered by Brazil, Suriname and Venezuela.